How well do you know your squid facts? If you only know the basics then it is time to find out more about these fascinating creatures. Chances are you will also gain an new appreciation for them as you learn more. Squid have gills just like fish. They are often mistaken for octopus. While they two are similar they are different types of creatures. Every squid features three hearts. They also move through the water tail first instead of head first. The Big Fin Squid species has ten arms while all of the others only feature eight of them. They are also all the same length which is interesting because other species feature arms that are of various lengths. The squid is definitely a common source of food for many other creatures living in the water. What is interesting is that other animals are able to digest all of a squid except the pointed beak of its mouth. These remains are often found inside of the stomachs of other animals. Many species of squid have a life span that is only about one year. The Colossal Squid is the largest invertebrate in the world. The smallest is the sepiolid squid. It is less than one inch long and weighs less than a quarter of an ounce. More than $100,000 was paid in 2005 by an aquarium in Australia for a block of ice that held the preserved body of a giant squid in it. 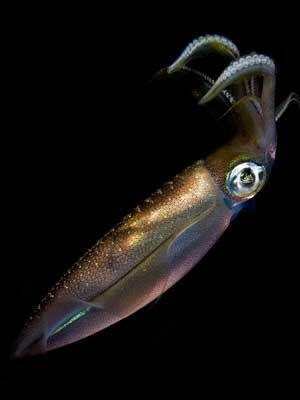 Some species of squid are able to glow in the dark. Research shows this is due to them having bioluminescent organs. The giant squid have eyeballs that are the same size as a standard basketball. Even though 300 species of squid have been identified and classified, it is believed there are at least 200 more that still need to be evaluated. It is difficult to study the giant squid because they live so close to the bottom of the bodies of water. Some species of squid have been found to live more than 13,000 feet deep in the water. A squid is able to swim by sucking water into the mantle cavity. Then they remove it through the siphon. This process continues all day long, even when they are sleeping. They don’t have an external shell which is a common identifier of mollusks. Instead they have an internal shell where the muscles attach and that supports the movement of the body. Most of the time squid are loners in the waters. However, there have been small groups of them identified. This can be due to many young being born in one location. When food sources are scarce or predators are a huge danger though they seem to group together in order to hunt easier and to stay alive. There is still a great deal that we don’t know about the squid though. As researchers are able to uncover more of the mystery, new facts come to life for us to benefit from. Make sure you explore the internet as well as books for that new information on a regular basis. That way you can always keep on top of what is going on with these fascinating creatures.